We can work collaboratively with you and your local partners to develop a plan to address low literacy either across a whole local authority or in priority areas. To find out more about our work and costs, email our Literacy Hubs Manager Jason Vit. We will work with you to tailor the pledge to your local priorities and existing initiatives, so that your school improvement work will be underpinned by a shared commitment to literacy. Schools become National Literacy Trust members and have access to a rich source of guidance and support based on our extensive research and experience. Signatory schools can display the Pledge certificate in their communal areas to recognise staff commitment, and to remind visitors of the high value the school places on literacy. Strategic, including an annual review of literacy provision and survey of children’s attitudes to reading and writing. Community, including building links with parents and beyond. In-school, which involves pupil-focused activities and appointing a governor responsible for literacy. We are delighted to have launched our first pledge with Ealing Council School Effectiveness Team where over 40 primary schools have taken up the challenge. We are working with a number of other local authorities, including our Literacy Hub areas, to develop their own versions. 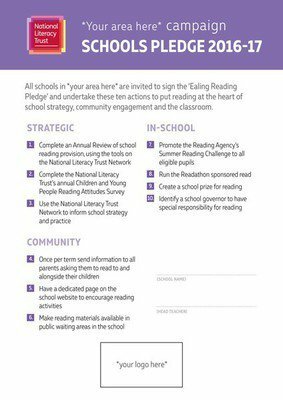 If you would like to work with us on a literacy pledge for your area, please email schools@literacytrust.org.uk with ‘literacy pledge’ in the subject line. Books Unlocked supports those in prisons and young offender institutions, as well as others in community settings such as schools and libraries, to read for enjoyment. We offer a range of bespoke, paid-for services to deliver long-term solutions to the entrenched literacy challenges which impact social mobility. Local businesses can play an important part in raising local literacy levels because they have the resources, reach and local knowledge to make a real impact.